The news has just been announced that former Tory Prime Minister Margaret Thatcher has died. For many, this is a cause for celebration, not mourning. Bourgeois reactionaries, liberal hypocrits and conservative throwbacks of all stripes will hover like vultures around these festivities in order to moralise about the 'dignity of death', lack of 'respect' for a 'Great Leader', etc., etc. The flood of cant and servility which has been poured out by the bourgeois press during the last few days, because the long-expected death of [Frederick III Emperor of Germany] a tyrant of the old type embedded in a modern type of tyranny, has at last happened, disgusts one so much that at first one is tempted to keep silence in mere contempt for such degraded nonsense. Court mourning is always a preposterous spectacle, but here is a case where it is more preposterous than usual. Conventional universal grief, when scarcely any one is grieved at the event, no one whose interests do not suffer by it, most people are profoundly indifferent, and a great many cannot help being glad, although the death of this man may make no immediate difference in the condition of the people who suffered from his life — what can one say of this? Yet though silence may be best in the abstract, it may be misunderstood at a time when even democratic papers, which are busy advocating federalism, profess to share more or less in the sham sentiment of the day which weeps strange tears indeed over the death-bed of this tough specimen of the ancient absolutist lined by the modern centralizer. As a Socialist print, the Commonweal is an outlaw from the press, and its poverty and desolate freedom compels it to speech, though but of a few words. For what the death of this sham mediaeval tyrant calls our attention to is a weighty and serious matter enough in spite of the nothingness of the man himself. The ancient and obviously irrational absolutism is gone from Europe except for the tottering throne of the Czar of the Russias; but the house of Hohenzollern has gathered to itself whatever of dangerous and practical in absolutism still exists, and has built up of it a fortress of the new bureaucratic absolutism as a last refuge to the capitalistic civilization of our day, arid has put a face of rationality and business capacity on it, so that the scarcely less grievous tyranny of constitutional bureaucracy under which we suffer might reach out a hand to it unashamed; and so helpful have our masters felt this fortress to be to the system which enables them to rob the people at home, that even the elevation by its builders of the Germans into a holy race of military and commercial conquerors which may one day swallow them up also, has not scared them from accepting their friendship. Abundance of patience, energy, skill, almost genius, have been expended in this attack on the progress of humanity, but not only these qualities were needed, and the most has been made of persons who could serve as instruments towards it, although they had no qualities but the blindness and dogged hardness inbred by their position. Of these instruments the person just dead was as fit for his post as might be, just as Bismark and Moltke have been fit for theirs; though the German centralizing absolutism is modern, a monarch or figure-head of the modern type would not have suited it as well as what was ready to its hand for the purpose, a mere stupidly implacable soldier without any capacity for doubt or remorse. The man who began his career of ‘glory’ by the slaughter of citizens in the streets of Berlin in ‘48, was a proper tool for the statesmen who saw the necessity of the system, which had bred them, of ‘educating’ Germany by constant wars of ambition, and was not likely to shrink from the last success of a hideous race war, which will when all is said, lead to events that these pests of humanity were far from foreseeing. Plainly then, the somewhat timid whitewashing by the Radical press of this figure-head of the most dangerous form of absolutism is a sorry business, and I must say sincerely that the German people are not likely to thank our press for it. Even the Daily News is compelled to allude to the Berlin massacres, though it speaks of them as an event to be lightly passed over, a venial offence, to be expected (as indeed it was) of a person in the position of its hero. But are the people of Berlin forgetting it? Are they really worshipping the memory of the pious hero of Sedan? If this is true of even a part of the population, it can only be said that it shows into what depths of degradation the vice of patriotism can lead people — of patriotism, that is, the cultivation of national rancour founded on the national development of selfish greed which is the basis of civilized society. 3.The FN is not more moderate under Marine Le Pen. ‘I passed her the baton,’ said Jean-Marie Le Pen after she took over from him in 2011. ‘If she runs faster than me, then so much the better.’ He remains the party’s honorary president and made a speech to members last year in which he quoted the anti-semitic writer Robert Brasillach, executed for collaboration with the Nazis. The FN continues to cultivate links with fascist groups and parties. Although older generations of Nazi collaborators are dying out, many FN leaders and election candidates are veterans of ‘revolutionary nationalist’ groups and retain links to white supremacist and organisations promoting Holocaust denial. In 2012, on Holocaust Memorial Day, Marine Le Pen was a guest of the Austrian Freedom Party at a ball in Vienna organized by the neo-Nazi Olympia society. Olympia bans Jews or women from its membership, once proposed that the Nobel Peace Prize be awarded to Nazi Rudolf Hess, and organizes celebrations of Holocaust denial featuring prominent revisionists like David Irving. 4.The FN is a threat to democracy. FN-run towns have been characterized by authoritarianism and intolerance, banning halal meat in school canteens, censoring library provision and clamping down on the ‘promotion of homosexuality’. Like her father, Marine Le Pen seeks to organize a capacity for extra-parliamentary activity through rallies, street demonstrations and links to openly ‘revolutionary nationalist’ groups. The FN has a track record of violence against its opponents. 5.Legitimising the FN breeds racist discrimination. Acceptance of the FN as a legitimate party has helped make racism respectable in France. The hijab is banned in schools. The wearing of the niqab and the burka is banned in public. One survey identified a 33.6% rise in racist acts towards Muslims in 2011 compared to the previous year. More French Muslims claim to have had negative encounters due to their religious or ethnic background (37%) than those in Britain (28%) or Germany (19%). The present text, which was first published unsigned in L'Ordine Nuovo on 11 June 1921 seems particularly germane to the present historical moment. It is republished here in advance of the anti-fascist solidarity demonstration outside the Greek Embassy in London on January 19th 2013, as well as in advance of the English Defence League's plans to march in Cambridge in February 2013. The political position of fascism is determined by the following basic circumstances. 1. The fascists, in the six months of their militant activity, have burdened themselves with an extremely heavy baggage of criminal acts which will only remain unpunished as long as the fascist organization is strong and feared. 2. The fascists have been able to carry on their activities only because tens of thousands of functionaries of the State, especially in the public security forces (police, royal guards, carabinieri) and in the magistrature, have become their moral and material accomplices. These functionaries know that their impunity and their careers are closely linked to the fortunes of the fascist organization, and they therefore have every interest in supporting fascism in whatsoever attempt it may make to consolidate its political position. 3. The fascists possess, spread throughout the national territory, stocks of arms and ammunition in such quantities as to be at least sufficient to create an army of half a million men. 4. The fascists have organized a military-style hierarchical system which finds its natural and organic apex in the general staff. It stands to reason that the fascists do not want to go to prison, and that instead they want to use their strength - all the strength which they have at their disposal - to remain unpunished and to achieve the ultimate aim of every movement: to hold political power. What do the socialists [social democrats] and the leaders of the Confederation intend to do to prevent the Italian people from being subjected to the tyranny of the general staff, the great landowners and the bankers? Have they fixed upon a plan? Do they have a programme? It does not appear so. Might the socialists and the leaders of the Confederation have fixed upon a 11 'clandestine' plan? This would be ineffective, because only an insurrection of the broad masses can break a reactionary coup de force; and insurrections of the broad masses, though they do need clandestine preparation, also need legal, open propaganda to give them direction, orient the spirit of the masses and prepare their consciousness. The socialists have never seriously faced up to the possibility of a coup d'état, or asked themselves what provision they should make for defending themselves and going over to the offensive. The socialists, accustomed as they are to stupidly chewing over a few little pseudo-Marxist formulae, reject the idea of 'voluntarist' revolutions, 'hoping for miracles', etc. etc. But if the insurrection of the proletariat were imposed by the will of the reactionaries, who cannot have 'Marxist' scruples, how should the Socialist Party conduct itself ? Would it, without resistance, leave the victory to reaction? And if the resistance was victorious, if the proletariat rose in arms and defeated reaction, what slogan would the Socialist Party give: to hand over their arms, or to carry the struggle through to the end? We believe that these questions, at this moment, are far from being academic or abstract. It may be, it is true, that the fascists, who are Italians, who have all the indecisiveness and weakness of character of the Italian petty bourgeoisie, will imitate the tactic followed by the socialists in the occupation of the factories: that they will draw back and abandon to the punitive justice of a government dedicated to the restoration of legality those of their own who have committed crimes and their accomplices. This may be the case. However, it is bad tactics to put one's trust in the errors of one's enemies, and to imagine one's enemies to be incapable and inept. Whoever has strength, uses it. Whoever feels that he is in danger of going to prison, will do the impossible to keep his freedom. A coup d'état by the fascists, i.e. by the general staff, the landowners and the bankers, is the menacing spectre which has hung over this legislature from the start. The Communist Party has its line: to launch the slogan of insurrection and lead the people in arms to their freedom, guaranteed by the workers' State. What is the slogan of the Socialist Party? How can the masses still trust this party, which confines its political activity to groaning, and proposes only to ensure that its deputies make 'magnificent' speeches in Parliament? The decision of the Cambridge Union Society to invite Kevin Scott, a long-standing regional organiser for the fascist British National Party (BNP), represents an atrocious failure of political imagination on the part of the Union’s elected officers. When Nick Griffin was invited to speak at the Oxford Union in 2007, students and anti-fascists broke up the meeting, breaking through the security cordon to stage a sit-in protest inside the chamber’s not-so-hallowed walls. Kevin Scott should expect the same treatment in Cambridge. Why? It is no coincidence that Griffin’s invitation to speak in Oxford had been justified on the grounds of a debate about ‘free speech’. Now, the CUS hacks, under the stewardship of President Austin Mahler, have tried to use the same erroneous logic to invite one of Griffin’s erstwhile underlings to Cambridge. Scott recently left the BNP, but not because of a change of heart; he left to join the ‘management team’ for the newly-formed British Democratic Party (BDP) set up by fascist Andrew Brons, the MEP for Yorkshire and Humber, who also resigned from the BNP earlier this year to set up the BDP (formerly, and very briefly, known as True Brits). The essence of the no platform argument is simple: to allow – indeed, to invite – fascist agitators to enter into the sphere of agonistic, rational debate is to give their ideology of violence, fear and hatred a cloak of legitimacy which it neither merits nor deserves. Doubtless the Union hacks think they have all the bases covered. The arguments of racists are easily defeated, so what’s to lose in subjecting Scott to a thorough grilling at the hands of UK PLC’s brightest-and-best squad? Such self-satisfied complacency overlooks the fact that politics takes place in the real world, which is a world away from the careerist hothouse of the Union Society. These people forget that when Nick Griffin was invited to speak on Question Time, a YouGov poll found that one in five viewers said they would be more likely to vote BNP after the would-be Fuhrer’s appearance. More recently, the Greek fascist (and ex-special forces operative) Ilias Kasidiaris physically assaulted two female socialists in a televised interview. This descent into physical violence did not have quite the effect that myopic liberal commentators would hope for: the popularity of Kasidiaris’ party, Golden Dawn, has since risen in Greece, and Kasidiaris himself is still ‘at large’ (sitting in the Greek parliament). The complacent assumption that his violent outburst ahead of the June 17th elections would lead to an electoral wipe-out proved false, in part because the commentators who made such predictions fail to understand the true nature of the polarisation taking place in Greece, in a period of intense neo-liberal austerity, ongoing capitalist crisis, as well as continuing decomposition of key sections of the bourgeois state and its apparatus. It has since been made known that Golden Dawn members have infiltrated many sections of the police, which perhaps provides some explanation as to why the warrant for Kasidiaris’ arrest resulted in neither a conviction, nor, even, an arrest. Turning to Kevin Scott’s previous record, we find that a BBC profile lists two previous convictions – one for assault in 1987, another for using threatening words and behaviour in 1993. In 2001, he penned an article for International Third Position – the journal of a neo-fascist BNP splinter-group – entitled ‘The Final Conflict’. You can guess what the conflict might look like. (The Southern Poverty Law Centre has a useful breakdown of this motley crew of crypto-Strasserites and self-styled revolutionary nationalists.) Apparently, this record makes Scott worthy of an invitation to speak at the Union. Why has he agreed to accept the invitation? He must know that he is hardly likely to win the debate, nor is he likely to win any new recruits (unless the Henry Jackson Society have yet to declare their maximum programme). Scott has agreed to speak to the Union so that he can go back out into the world and wear the free publicity given to him as a badge of respectability and normality. He can include the photos in electoral propaganda. He can trumpet his high-profile speaking engagement in mail-outs for his delightful little fundraising operation, misnamed Civil Liberty. The Guardian recently exposed Civil Liberty as a BNP front-group, set up to raise money from far-right nut-jobs in the US. Why should the Cambridge Union Society lend any material support to such an organisation, or its agitators and fundraisers? Such publicity-seeking, ill-reasoned and politically naïve invitations can only contribute to a culture in which fascist ideology is normalised and its advocates made to seem spuriously legitimate. The jackals of the extreme right believed they found the crucial pressure point when they seized upon immigration as the main issue to rally around. While a network of ultra-right wing cadres continued to function as the violent vanguard of xenophobia, some shock troops from Europe’s neo-fascist underground split off to form mass-based political parties. One of the advantages of this dual-pronged effort was that it provided an electoral front for hard-core militants, who underwent an ideological face-lift and watered down their pronouncements to conform to electoral requirements. By the mid-1980s, a flock of radical right-wing parties had found a nesting place on the democratic landscape. The initial success of the Front National in France and its emulators elsewhere showed that large segments of Western European society were vulnerable to national populists and the totalitarian temptation they embodied. A public debate about ‘no platform for fascists’ took place in France in the 1980s, addressing the question of whether or not the fascist Jean-Marie Le Pen ought to be accepted as a ‘normal’ part of French political life. The liberals won the day: Le Pen’s ‘shock’ breakthrough into the second round of the presidential election of 2002 did not take place in a vacuum. The liberal 'free speech' arguments paved the way for his success, but the real nature of the French National Front remains clear for those who care – or bother – to look. The National Front is now like a bad smell in French politics which refuses to go away; the liberals are responsible for having boiled up the sprouts. As far as Scott’s invitation is concerned, the other speakers on the Union’s panel should also pause for thought. If, as the proposition will argue, hate speech is not a human right, how can the decision to share a platform with a fascist appear as anything other than a decision made in abysmally bad faith? On their own terms, they are hypocrites. If they actually believe that hate speech is not a human right – insofar its vocalisation entails the potential for politically dangerous material consequences – they would shun the possibility of sharing a platform with a fascist. One must conclude, instead, that the speakers for the proposition will simply temporarily assume the position for ‘the sake of the debate’, before moving on to give strenuous consideration to the relative merits of blue as opposed to green bottle-tops. The Union’s term-card is deliberately vague, but if Scott is proposed as a candidate for the proposition then the Union’s hacks are not only hypocritical, but suffering from an acute case of historical amnesia. When dealing with fascist political organisers, such as Scott, the other side of the liberal argument (for which Voltaire provides the well-known locus classicus: “I disapprove of what you say, but I will defend to the death your right to say it”) requires serious attention, not least because fascist politics has led – and could lead again – to the kind of the violence about which Voltaire offered only hypothetical speculations. François-Marie Arouet did not actually give his life to defend another person’s freedom of speech; but hundreds of thousands died fighting against fascists in the Spanish civil war and during the Second World War. We might do these young men and women the courtesy of remembering that fascism is not a normal, run-of-the-mill form of politics, nor should it be treated as such. The BNP (and, now, the BDP), along with other neo-Nazi organisations in Europe, pose as legitimate, in order to be allowed to play the representative-democratic game – and they are very bad actors, so the fact that some liberals are taken in speaks volumes – but, as ever, their intention is to change the very rules and nature of the game itself. Theirs is a category of speech which does not merit protection, as the very terms of the Union’s debate seem to acknowledge, at the same time as Scott’s invitation undermines any real commitment to put this acknowledgement into practice. It is currently left unclear whether any of the Union’s speakers will argue that hate speech is, in fact, a human right. Much will hinge on the precise definition of the category of hate speech. Scott will, one assumes, want to claim that the BDP and its ilk do not engage in types of speech which can be described as ‘hate speech’. Fascist agitators – the clever ones, at least – will know that there are laws which prevent them from giving vent to the full gamut of their political views, so they are forced to fall back on cannier tactics, such as accepting invitations to speak at high-profile public events (as and when the organisers are thick-headed enough to make the offer). Similarly, Nick Griffin knows he is legally disbarred from directly inciting racial hatred, so instead of talking about racial purity, he talks about identity: it is quite a cynical PR exercise; he has said so himself. As the little parable about Kasidiaris should demonstrate, however, when the political context changes, when the barbarism of capitalist crisis suddenly makes the foundations of bourgeois liberal democracy seem somewhat less secure, fascists gain the confidence to start acting out the desires they keep carefully (and not so carefully) pent up. One need only look to the strength of Jobbik in Hungary, an organisation whose members march with side-arms and conduct pogroms against Roma families; or Greece, where Golden Dawn street militias conduct sweeping raids against migrant traders. Why, the hacks at the Union might ask themselves, have they given any quarter to an organisation of this kind? Must they be reminded of the history and origins of the British National Party, an organisation to which Scott belonged for over twenty years? Can they not see that it, and the BDP, are parties which are different from the mainstream bourgeois parties, not only in degree, but in kind? Fascism is a qualitatively different form of political organisation. Those who retain any illusions in this regard need to disabuse themselves very quickly. The real reason the hacks at the Union have invited this fascist to speak is because of the culture of short-term, big-splash spectacularism which prevails there; officers are elected for short periods of time, which encourages the courting of controversy for its own sake, in an attempt to boost membership, as well as in the hope of securing a few extra Curriculum Vitae nectar points. Enough people in the National Union of Students realise the dangers of allowing fascists to speak on University campuses, which is a why the NUS currently supports a principlied 'no platform' policy. On what democratic mandate did Austin Mahler decide to break from this important principle in the student movement? Scott’s invitation should be immediately revoked; if it is not, students, trade unionists and all those whose interests are threatened by the fascist right should organise to intervene in the ‘debate’ – as if the proposition even needed to be debated in the first place. Martin A. Lee, The Beast Reawakens: Fascism’s Resurgence from Hitler’s Spymasters to Today’s Neo-Nazi Groups and Right-Wing Extremists (London: Routledge, 2000), p. 388. 29/12/2012: A message on the Union's Facebook page subsequently confirmed that Scott is "UNABLE" to attend. Griping about the situation on his not-so-Civil Liberty blog, Scott vowed to "[stand] up to the cranks of the so-called 'anti-fascist' movement" and added that his organisation "intend[s] to do it on our own terms". These 'terms' are left unspecified, so they must left to the imagination. On 14 November more than ten million workers will be striking together in Greece, Spain, Italy, Portugal, Malta and Cyprus. This follows a wave of youth revolts and election victories for the left. Resistance to austerity has entered a new phase with this day of revolt against the austerity policies of the Troika. In Greece there have been more than 20 general strikes that have shaken governments and transformed politics, but austerity continues. How can we explain this paradox? What does N14 mean for the development of resistance in Europe? Can general strikes smash capitalism? In Britain today, the call for a general strike is widespread in the labour movement, yet many union leaders retreat from action. How can we overcome this, and make sure we are on board for the next ‘N14’? Come and join the discussion. All welcome! Erasmus Room @ Queens. Enter via Porters Lodge, over the bridge, across the courtyard and to the right up the stairs. Unfortunately the room is not wheelchair accessible. Ring 07821177250 if you need directions. Obama has disappointed many in over the last 4 years, failing to close Guantanmo Bay, and continuing with the war on terror. Yet many will voting for him on 6th November, as the prospect of Romney and the Republicans being in power is much worse. But is there any real difference between the choices on offer? Megan Trudell will introduce a discussion on what the outcome of this election will mean for the future of politics in the United States and internationally. Malcolm X is unquestionably one of the great icons of the Black Power Movement. His emergence in the mid-1960s sparked one of the most exciting and dramatic episodes in the history of black struggle in the United States. Weyman Bennett (Joint Secretary, Unite Against Fascism) will discuss the legacy of Malcolm X and how not even the bullets of an assassin’s gun could put an end to the growing radicalism that he inspired. Cambridge students joined hundreds of thousands of others to protest against the actions of the Tory government on the “For a future that works” demonstration called by the TUC yesterday. The march saw over 150,000 people (official TUC figures) take to the streets of London with many thousands more joining demonstrations in Glasgow and Belfast. In workplaces across Cambridge trade unions organised coaches for their members to travel down to the demonstration, joining huge blocks formed of members of individual unions. Two coaches of Unite members joined the 10,000 strong contingent towards the front of the march, as well as coaches from Unison, PCS, NUT and UCU. Other groups also held feeder marches and actions., including a climate block leaving from St Paul's which called for support for the million climate jobs campaign, and Disabled People Against the Cuts (DPAC) who occupied the road at the end of the demo, blocking the way to Park Lane. The numbers and spirit on the march demonstrate that the anger and desire for action which, in numerous cases the trade union bureaucracy have tried to stifle and sell out after the magnificent mass strike on November 30th last year, has far from dissipated. People know we need to take on the Tories and that we have the power to do it. Ed Milliband was booed when he said labour would make cuts, but when trade union leaders talked about a general strike, they were drowned out with applause. The march yesterday won't, on its own, stop the government, but a general strike could. The militant education block, which Cambridge students joined, showed the kind of spirit we need to bring to the NUS demonstration on the 21st November. 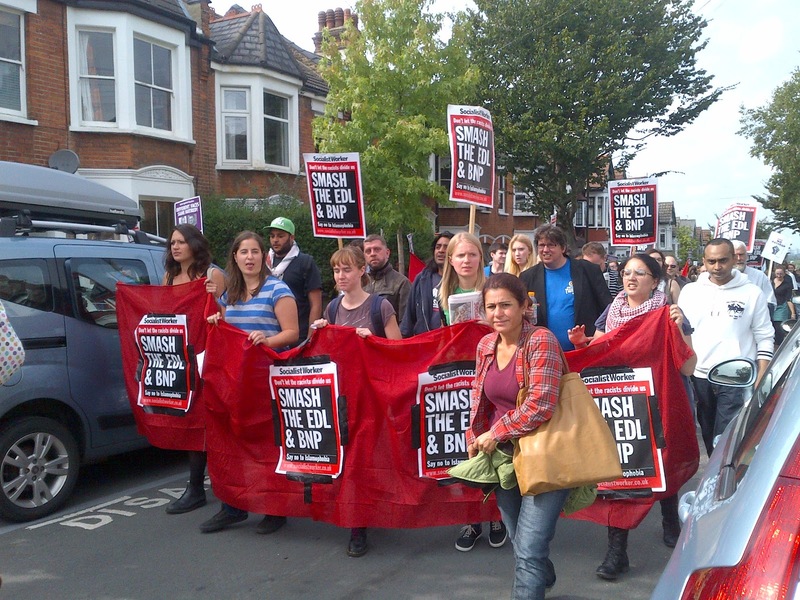 The previous NUS protest in 2010, which CUSU organised 10 coaches of students to travel down to was the spark which ignited widespread strikes and protests against cuts and austerity. 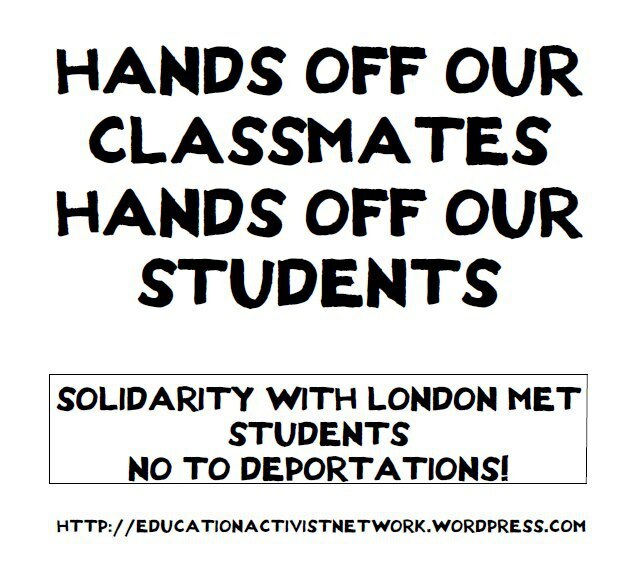 Over the next month we need to ensure that this is also a huge demonstration to defend the future of education! Cuts, abortion rights and family values - Are the Tories a threat to women? Women, particularly black and LGBT women are being disproportionately affected by the Tory cuts. There is also a propaganda campaign underway over abortion access in Britain. Right wing bigots are trying to create the impression that the law is too liberal and access to abortion is too easy. In this meeting, Jen Wilkinson will talk to us about how and why the Tory cuts hit women the hardest, why abortion rights are so important and what we can do to fight back. Erasmus Room @ Queens. Enter via Porters Lodge, over the bridge, across the courtyard and to the right up the stairs. Unfortunately the room is not wheelchair accessible. Joseph Choonara, author of Unravelling Capitalism: an introduction to Marxist Political Economy, will introduce Marx’s approach to understanding capitalism - developed above all in the three volumes of Capital. He will also outline how this can be applied to capitalism as it has developed since Marx’s time, particularly with reference to the crisis we are facing today. The meeting will take place in the Erasmus Room of Queen's college, access via the Visitor's entrance on Queen's Lane. Through the courtyard, upstairs. There will be signs giving directions to the room. Come along to the first SWSS meeting of term! Karl Marx is one of a handful of people who fundamentally changed the way we see the world. His ideas have always been controversial and misunderstood. Today’s world has been rocked by major capitalist crises, revolutions and revolts from the Arab Spring to the Occupy Wall Street movement. Alex Callinicos is Professor of European Studies at King’s College University and the author of Bonfire of Illusions: The Twin Crises of the Liberal World and The Revolutionary Ideas of Karl Marx. He will be discussing Marx’s ideas and explaining why, ultimately, Marx was right. Meeting will take place in the Erasmus Room of Queen's college, access via the Visitor's entrance on Queen's Lane. Through the courtyard, upstairs. There will be signs giving directions to the room. We're really pleased to be able to put up the termcard of discussions that Cambridge SWSS will be hosting in the coming term. 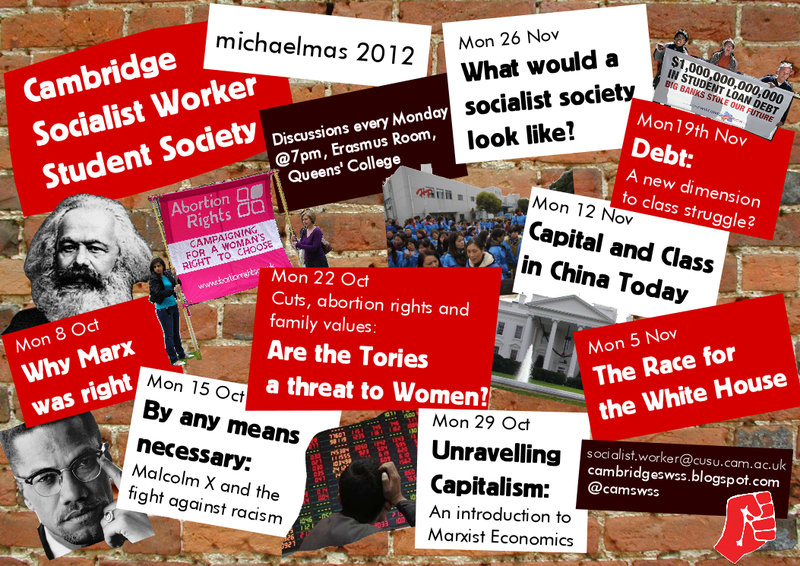 Meetings will be taking place every Monday at 7pm in the Erasmus Room, Queens' College. All welcome! Keep watching this space for the exciting speakers we will be having to introduce these discussions. Cuts, abortion rights and family values: are the Tories a threat to women? Debt: a new dimension to class struggle? 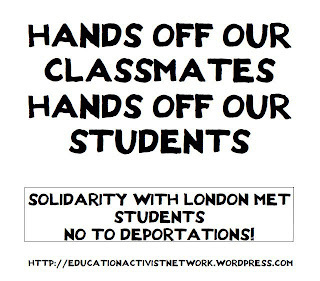 The announcement by the U.K. Border Agency that it has withdrawn London Metropolitan University’s licence to sponsor international students is shocking, but it comes as no surprise to migrants right's campaigners, who have seen increasingly draconian action being taken by the government against non-EU immigrants for some time. The decision has plunged thousands of international students at the university into crisis, even when it is has been acknowledged that the majority of those affected are entirely innocent of any wrong doing. It’s not just students that are being targeted. Family members of British citizens who want to join their loved ones in the U.K. are now faced with harsh new laws and restrictions at every turn. Since the 9th of July this year any foreign ‘spouse’ wishing to join their partner in the U.K. must now be able to prove level B1 Intermediate English language skills and sit a ‘Life in the U.K’ test before being allowed to enter the country. Previously the required level was A1 beginners, an achievable qualification for a majority of language learners. It can take years of involved study and a considerable talent to reach an intermediate level of proficiency in any language, especially when trying to learn in a country where the language is not spoken or not necessarily taught well. The new requirement is designed to be unachievable and to therefore prevent people from visa application success. Add to this a requirement to prove knowledge of life in the U.K. without ever having set foot here and you start to see that the government’s tactic is to make an impact on immigration figures wherever it can, fair or not. But this is just the tip of the iceberg. In family visa applications from outside the EU, the British ‘Spouse’ and sponsor must now be able to prove that they are earning an income of £18,600 a year and that they have been earning this much for at least 6 months before any application will be accepted. They must then continue to prove this level of income for the next 5 years. Effectively, if you lose your job or become ill or go on maternity leave, you won’t be able to rely on the support of your husband or wife as they will automatically be in breach of immigration regulations and be expected to leave or be deported. The changes are affecting large numbers of people and are proving to be hugely discriminatory. Already it is clear that the income threshold of £18,600 a year excludes about 47% of the working population of the U.K. If you are a woman, from the Bangladeshi or Pakistani community, young or from the North of England, Scotland or Wales, that figure rises still. If you are the foreign spouse and you are bringing your children with you, the income requirement of your sponsor increases by £3,800 per year for the first child and £2,400 per year for each subsequent child. Vulnerable family members of people living in the U.K. are also being targeted. Previously families were able to bring elderly relatives to live with them; this was based upon the family’s ability to demonstrate that they had sufficient funds to pay for their care. New changes to this category mean that if you can prove that you have the funds to pay for the care of your relative, then you will be expected to arrange for that care to take place in their country of residence. Your relative will not be allowed to join you unless you can prove that alternative arrangements for their care cannot be found. An impossibility, as it will be argued that you can pay for a home help or live in carer to care for your relative, wherever they are. The Conservatives are desperate to prove to their voters that they are taking action on immigration and will reduce net migration ‘from the hundreds of thousands to the tens of thousands’ by the next election. Full right of appeal has been removed for family visitors whose visa application has been refused and there are also to be restrictions on the use of Article 8 of the European Convention on Human Rights and the right to private and family life. Teresa May thinks that this right should not be seen as ‘absolute’ when it comes to immigration and that public interest and protecting the rights of the taxpayer should take precedent. Anti-immigrant rhetoric has been whipped up in order to create the conditions for these changes - talk of ‘illegal immigrants’ who come to the U.K. to break the law and exploit the benefit system. However, those that are familiar with immigration rules know that non-EU migrants have never had recourse to public funds and only have limited access to welfare benefits after they have worked and paid National Insurance contributions for a year. Nor are non-EU migrants eligible for social housing or free treatment on the NHS. The government is targeting groups of people that were already meeting the requirements set out by the UKBA and is using them to make it appear as though they are sticking to their election pledges. International students pay tens of thousands of pounds to come here and non-EU family members become suitably integrated with the help and support of their British families. The government in its desperate attempt at political point scoring is taking action that could possibly be unlawful based on paranoid, dishonest, incoherent and confused notions around migration. Campaigners hope that the cracks will begin to show soon as case by case the appeals of families and individuals are heard and decisions overturned. Not to mention the legal challenges that will come when it becomes clear just how discriminatory these changes are. Until then there are thousands of people suffering from enforced separations and threatened deportations and we must act in complete solidarity with all those affected. We should support the campaigns that are building. For more information check out the links below. Anti-fascist activists from Cambridge Unite Against Fascism joined thousands of others to oppose the EDL in Walthamstow yesterday. 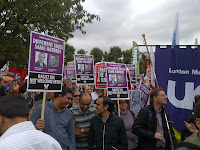 The EDL were humiliated as activists from Walthamstow, and beyond, prevented them from marching on their planned route. 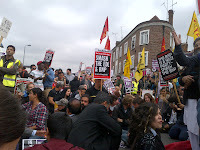 Demonstrators on the “We are Waltham Forest” march, opposing the EDL, staged a sit-down protest, blocking a key junction, forcing the EDL though back streets. 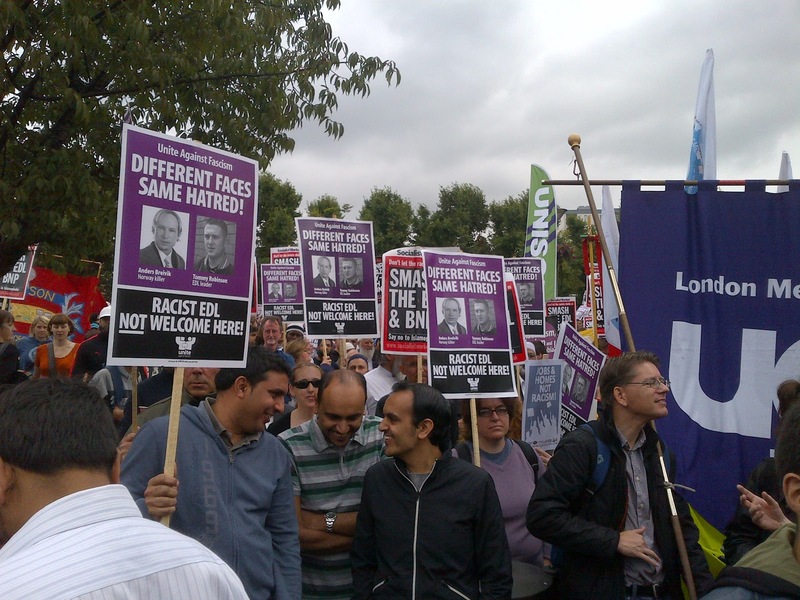 The EDL only managed to draw about 200 to their protest, while the anti-fascists numbered around 4000, and represented the diversity of one of London's most multiracial areas. Activists held the junction throughout the day, as well as a smaller group blocking the area outside the Town Hall, where the EDL had planned to have their rally. A dejected and humiliated looking Tommy Robinson, the leader of the EDL, attempted to address a small group of 12 or so supporters over shouts of “Nazi scum off our streets”. From the vibrant and lively anti-fascist gathering it was hard to tell that the people Robinson was speaking to were meant to be a rally. We opposed the EDL marching in Cambridge last year, and stopped them from marching in Walthamstow yesterday. We showed the way we can stop fascists marching. You can ask them all the hard questions you want, but the only thing that will actually stop them is by organising thousands of black and white activists to take to the streets and oppose them there. Coming soon - Michaelmas 2012 termcard! 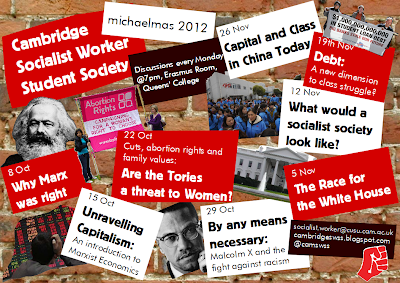 We will soon be posting the termcard for the upcoming term, along with details of other demos and activist events that Cambridge SWSS will be part of in the coming year. If you are interested in being involved with SWSS this year get in touch - our email address is socialist.worker@cam.ac.uk! We hold weekly discussions on everything from Marxist philosophy, how do we fight for women's liberation, Palestine, and the Egyptian Revolution. Let us know what kind of meetings you'd like to see over the next year. We don't just talk about socialist ideas, but are active part of the struggle. Over the last year we have been involved in the fight against the government's attacks on higher education, in showing solidarity with workers taking action, protesting against Dominique Strauss Kahn's visit to the Cambridge Union, defending the right to protest and stopping the threat of the EDL and BNP. With the economic crisis set to continue it is crucial that we fight together against austerity and cuts. If you're in Cambridge over the summer, the Cambridge Town branch of the Socialist Workers Party meets every Thursday, 7:30pm, in CB2 Cafe, Norfolk St (click here for a map). All welcome! A Year on from the Riots: Is there an Underclass? 1. How are ordinary people being affected by the austerity measures? At the moment Greece is a huge laboratory of social engineering with a continuing escalation of attacks on the working class. Unemployment is officially at 22 per cent, but the real figure is likely higher as people who have not had a job are not allowed to register as unemployed or claim unemployment benefit. Many industrial plants have closed, with private sector workers being sacked. 20,000 people have already lost their jobs in the public sector and the government is planning 150,000 further redundancies. Nearly 40 per cent of all public sector employees will lose their jobs. Before austerity, there was easy credit. Now people cannot pay back their loans, they can’t pay for their rent or for their mortgages. At schools across the country teachers are seeing real poverty. Children are coming to school starving and fainting in the class because their parents are unemployed, without unemployment benefit and cannot afford bread and milk to feed them. There has been a 35 per cent cut in salaries in the last three years for all public sector workers. Now, with the Memorandum 2, the troika (EU-IMF-ECB) with the Greek puppet government is cutting the Minimum Wage, from €700 a month to €400 a month. Recently there have been reports of people committing suicide because they cannot bear the effects of the crisis on their personal, political and social lives. However, in Greece there are also some examples of workers’ control. Sacked journalists have taken over a newspaper (Eleftherotypia), medical doctors and nurses are organizsng health centres to provide free medical care for the unemployed and homeless. We have food kitchens, feeding the rapidly increasing numbers of homeless people. These acts of solidarity from below are embryonic forms of workers’ self-management. 2. What is the situation like for those working in universities in Greece? university lecturers’ salaries has been reduced by nearly 35 per cent and are going to be further reduced, despite already being extremely low. 3. The process of neoliberalisation of the higher education sector in Britain has been occurring - has the same happened in Greece? Institutional structures, management and the funding of Greek universities have been under attack for the past two years. This is another aspect of the devastation brought upon Greek society by aggressive neoliberal policies. New laws have been passed in another attempt to conform to the ‘Bologna Process’ requirements, which severely jeopardises university autonomy by taking power from the Senates – (representative bodies of university teachers, student sand other employees) – towards ‘University Councils’, consisting of university professors and representatives from the business world. The law is full of references for universities to look for funding in the business sector. In line with recent reforms in most European countries the new law is tailored to the needs of the current austerity packages imposed by the troika. It opens the door to a wave of department, and even university, mergers and closures, in the name of ‘efficiency’, ‘performance’ and ‘viability’. higher education in Greece faces the danger of shrinkage: fewer departments, students, and lecturers. 4. What is the relationship between staff and students taking action in universities? established a national coordination committee to organise opposition to the law from below. This coordination committee effectively mobilised students and university staff and so, for now, the new Law has not been implemented at the universities. This is a partial, but very important, victory for the university movement. 5. We have heard a lot about the many general strikes that have taken place in Greece over the last couple of years. Can you describe what the atmosphere is like on the strikes and demos? police were determined to expel thousands of demonstrators, who had been standing for hours at Syntagma Square. The militancy and persistence with which the workers and young people protested for hours was remarkable. 6. What do you see as the way forward in Greece to winning the fight against austerity? The left is facing a challenge of historical proportions.Greece has a bright history of social resistance stretching back to the 1970s. Following the youth revolt of December 2008 over the shooting of Alexandros Grigoropoulos, the Greek workers’ movement has responded to the government’s cuts packages with a wave of strikes and demonstrations. Anger is growing and mass strikes and demonstrations are exemplary of the workers’ resistance. that can lift the economy out of the crisis on the basis of giving priority to people’s needs rather than profits and imposing workers control over the market. 7. What can we do in Britain to show support and solidarity for Greek workers resisting austerity? elsewhere. I think that initiatives of organizations of the anti-capitalist left in Europe expressing their solidarity with the Greek labour movement are crucial. With confidence in the potential of collective struggle and workers’ militancy, we can defeat the forces of capital and open up the way for an anti-capitalist alternative. 8. What do you think about the outcome of the election? In these elections the left as whole scored an important victory with nearly 35% of the total vote. Among the left, the main winner is considered to be SYRIZA, the radical left coalition enlarged with small bourgeois parties and traditional social democrats, which scored 17 per cent of the vote. The political crisis in Greece is deepening and new elections have been called for the 17th of June. Our political tasks for the forthcoming period need to be forming a United Front of all working class organisations to combat the rise of neo-Nazism. We also need to coordinate workers' struggles from below to overturn the neoliberal austerity measures; this united action should be expressed on the political level as well. Finally, the internationalist dimension of the workers' struggles in Greece need to be strengthened as the solidarity of the European working class is crucial in the coming period. Kostas Skordoulis is Full Professor of Physics and Epistemology at the Department of Education, University of Athens. He is the editor of the journal Kritiki: Critical Science & Education and the leading figure of the critical education movement in Greece. He is a member of ANTARSYA, the Greek anticapitalist left coalition and the organiser of the Radical Scientists Network in Greece.